Fair warning - this is a LOONNG post! I've been running behind on some things. First of all, I'm choosing my favorite picks from Sugar Bee Crafts' link party! You can see my post here. I got tagged a week or two ago (sorry for the delay!!) by Kayla's Creations and yesterday by Marilyn from 4 You With Love. Thank you both! 5. Let them know you've been tagged! 1. If you could have one wish granted, what would it be? Probably to fly. Totally cheesy, I know, but could you imagine how fun that would be? 2. Are you a coffee drinker? Hmm.... I'm a huge musical fan! My favorites are Les Miserables and Wicked. I love all their songs! My dog, Zoe, who is a chihuahua-dachshund mix. I also have a pet snake, Severus Snake (for all you Harry Potter readers!). 5. What is your favorite room in your home? I honestly don't know. I love my bedroom, because it's so comfy. I love the upstairs loft, which is always sunny and bright. I love the living room, where family time happens most. How can I pick one? Tangled, The Hunger Games, Harry Potter, The Princess Bride, RED, and Men in Black. Such fun movies! I like to either take a shower, or sit on the couch and watch Netflix. Winter and Summer. I love Winter because of the nice, cool weather and Christmas crafting. I love Summer because of swimming and longer hours to craft! 9. Do you have a favorite holiday? If so, what is it? Christmas. Yep, I love it! So many goodies and family time. 10. What would you eat everyday if you could? Probably Pizza. It can be made so many different ways and tastes so good! Or maybe oranges - I love fruit. 11. Do you enjoy cooking? Thanks Kayla for those awesome questions! 2. How many children were in your family and what is your birth order? I have a brother and a sister. I'm the youngest and my sister is the oldest. 3. If you are married, how did you meet him? I'm not married, so I haven't met 'him' yet! I am usually out and about, but sometimes I am at the craft store! 5. Do you do any volunteering and if so what/where? I do a charity community yard sale each year, and we all put lots of volunteer time into donating, pricing, and making signs! Each year the money goes to a different organization. 6. What is your favorite activity that you blog about? I love making photo tutorials about crafts! I'm not sure... maybe when I met my best friend or a Christmas with my family. 8. Who is your (fantasy) dream guy? Oh boy! My 'dream guy' would be someone who loves the Lord and has a heart for others. And someone who likes crafting! 9. What is the "creating/crafting" skill your mom/grandmother taught you and you always think of them whenever you make something with this medium? I don't think there's any crafting/creating skill I have gotten from relatives. But my great-grandmother taught me three different ways to play Solitaire when I was 10. 10. Where do you see your blog 12 months from today? I see a new, fun design, a sidebar full of sponsors, an email contacts list full of new friends, and a pile of crafts in my closet! I admire my Mom's heart for others. She continuously is helping the homeless and friends in need. 2. Do you have a favorite color combo? 6. Where do you see your blog a year from today? 7. Who is your favorite singer/actor? 10. Describe something specific you would have in your dream craft room/kitchen. 11. What's your favorite thing about blogging? 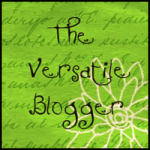 I got my second blog award! I am so excited! I have been nominated by Michelle from Michelle's Tasty Creations. Thanks so much Michelle! 1. Make sure to add this too! That's it! Oh boy - I've nominated 15 blogs below who I follow regularly. 1. I love strawberry ice cream. I used to think I didn't like it much... oh well, all those years of my life wasted without strawberry ice cream! 2. I am totally addicted to entering giveaways. Seriously! I win them sometimes, which makes me overjoyed! 3. I have a few cereal boxes and granola bar boxes on a shelf waiting for a craft. Haha! 4. I also have two egg cartons waiting for a craft! 6. I am attracted to office supplies. Am I the only one? 7. I have a binder full of ideas that I haven't done yet. I don't know when I will! Wow! Congratulations if you made it to the end of this post! All of you bloggers who I tagged/nominated - CONGRATULATIONS! You deserve it! And now to end this never-ending post.